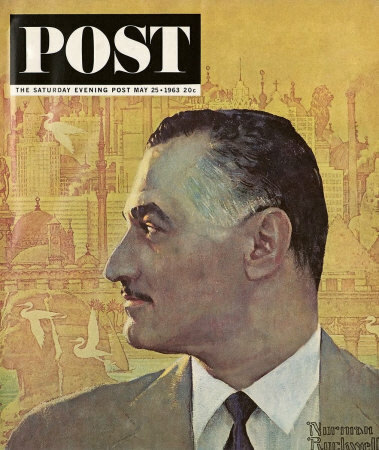 Portrait of Nasser, a Norman Rockwell painting , appeared on the cover of The Saturday Evening Post published May 25, 1963. This is another timeless favorite of Rockwell collectors, a classic for all the ages. This painting was Rockwell's 322nd overall out of 322 total paintings that were published on the cover of the Saturday Evening Post. Rockwell's career with the Post, spanning 47 years, began with his first cover illustration, Boy With Baby Carriage in 1916 and continued through his last, Portrait of John F. Kennedy, in 1963. This was also the fourth cover for The Post in 1963. In 1963, there were five Norman Rockwell Saturday Evening Post covers published. One of the covers, the final Rockwell image on the Post cover, was a reprint of the 1960 Portrait of John F. Kennedy, republished in memoriam. on page 239 of Norman Rockwell, A Definitive Catalogue by Laurie Norton Moffatt. When Norman Rockwell travelled to Egypt to paint a portrait of Egyptian President Gamal Abdel Nasser, the handsome president had his own ideas about how the painting should look. Nasser was a handsome man and knew it. He wanted a front view portrait painted. Rockwell, on the other hand, felt that Nasser's smile would show more teeth tha he wanted in his portrait. Rockwell wanted the profile portrait. Nasser was stubborn about his preference. Every time Rockwell would start sketching, Nassser would move from the profile to the front view and smile. Rockwell persisted, even physically moving the President again into the pose he wanted. Nasser finally did give in and maintained the pose the artist preferred. Rockwell had outlasted the Egyptian President. Portrait of Nasser was only one of 322 Norman Rockwell Saturday Evening Post covers; Here is the list of Norman Rockwell Saturday Evening Post cover illustrations. Rockwell painted this portrait during the same trip in which he painted his Portrait of Nehru. Portrait of Nasser was the last original published painting of Rockwell's on the Saturday Evening Post. The last Post cover, Portrait of John F. Kennedy, published in memoriam of the fallen President, was actually originally published October 29, 1960 and was thus a reprint. Do You Have A Great Story, Opinion Or Contribution About Portrait of Nasser?